Let’s take a look at how to decode ancient Indian carvings, and by the end of this blog post you will realize that understanding these gods leads us to completely new discoveries, which are hiding in plain sight. Watch the video below, or you can read further. 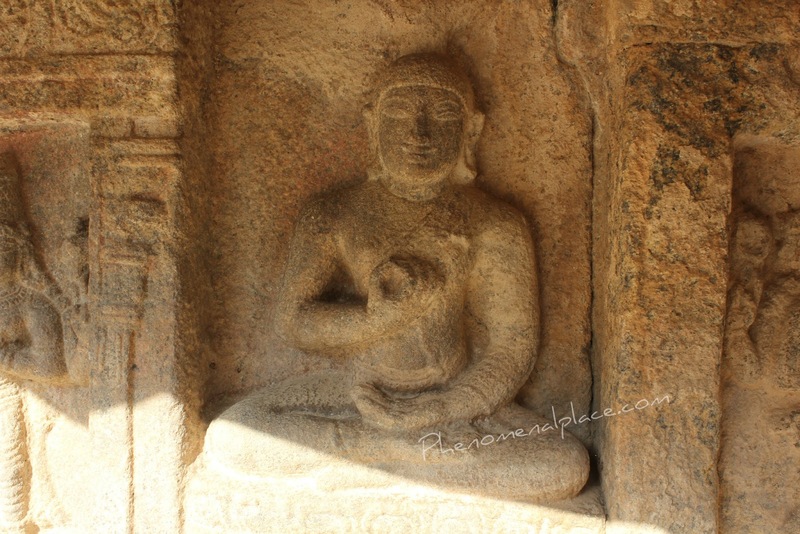 The Airavatesvara temple at Darasuram houses thousands of carvings. Historians think the temple was built about 850 years ago by Chola kingdom. One the temple wall, there is a deity carved who holds 2 flowers in his hands. If you read Indian scriptures, you will realize that this represents the Sun God, Surya. Now, within a distance of 10 feet, on another side of the temple, we can see the same Sun God carved again. This is a rare sight, to see the same deity carved twice, close to each other. Why did the ancient builders carve the same god twice, within a distance of 10 feet? Of course, the standard answer is quite simple: It is a Hindu temple, and thousands of gods are carved for religious worship. This is not a satisfactory answer for me, because I’ve always argued that every carving was done for a specific reason. So, I take a closer look at each of them. 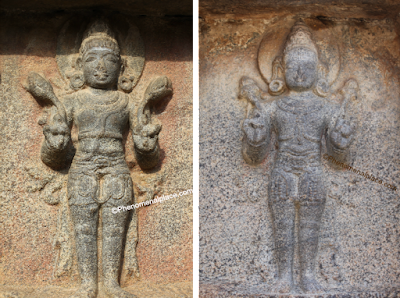 Here are these 2 carvings side by side, and you can try to figure out the difference between them. What is the difference between these 2 Sun Gods? What did you find? The carving on the left shows that the flowers are just beginning to bloom – look at the petals. The carving on the right, shows the flowers in full bloom, the petals are wide open. In ancient Vedic texts, the Sun God is shown holding 2 lotus flowers. The lotus will begin to bloom in the morning sun and will remain wide open until the sun sets in the evening. So, this carving represents the Morning Sun, and this carving represents the Evening Sun. So, we have now understood the meanings of these 2 carvings, but we are only scratching the surface of the mystery. 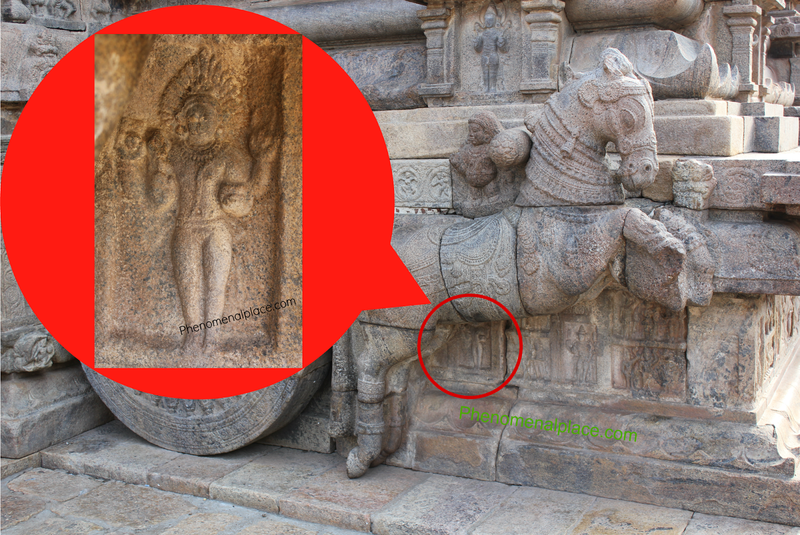 You can see that the Sun God is carved above the horse. Is anything carved below the horse as well? Hidden from the eyes of casual visitors, this deity is carved underneath. Who is he? From his hair, and the weapons he is holding, he can be identified as a god by the name of “Kaala Bhairava”.If you look at the standard explanations of this God, it is somewhat simple and it is known as a fierce or frightful form of Lord Shiva. But a deeper look into this deity, shows that the word Kaala means Time and the word Bhairava is split into three words, Creation, Sustenance and Destruction. So, the real meaning of Kaala Bhairava is something similar to the eternal timekeeper. Now, we know the meaning of these 3 carvings, but we still don’t know why they have been carved. Think of these 3 deities: The morning sun, the eternal timekeeper, and the evening sun. What could they possibly indicate? What are these horses doing in the middle? 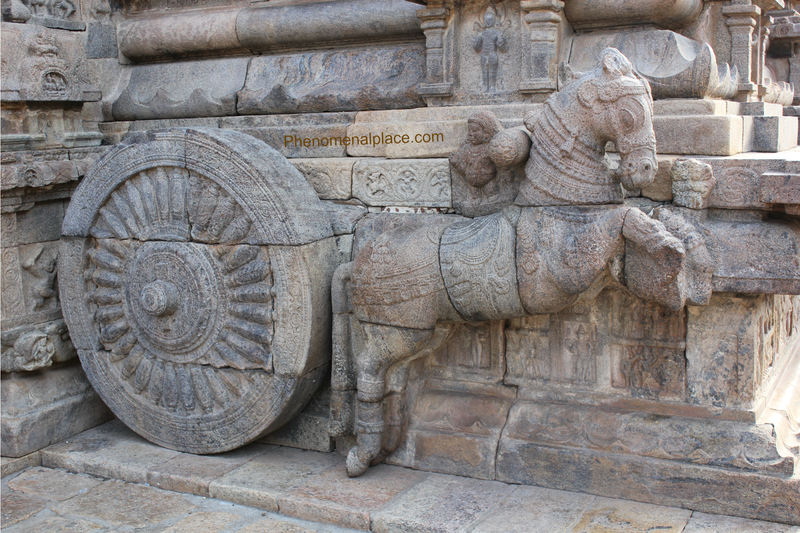 If you take a step back and look at the entire picture, the horses on either side are pulling the entire temple, which is shaped like a chariot using these 2 wheels! Why are these wheels carved here? Each wheel is made of multiple rocks, this is not a monolithic block. I am not gonna go into the details of how difficult it is to create a circle out of multiple rocks. 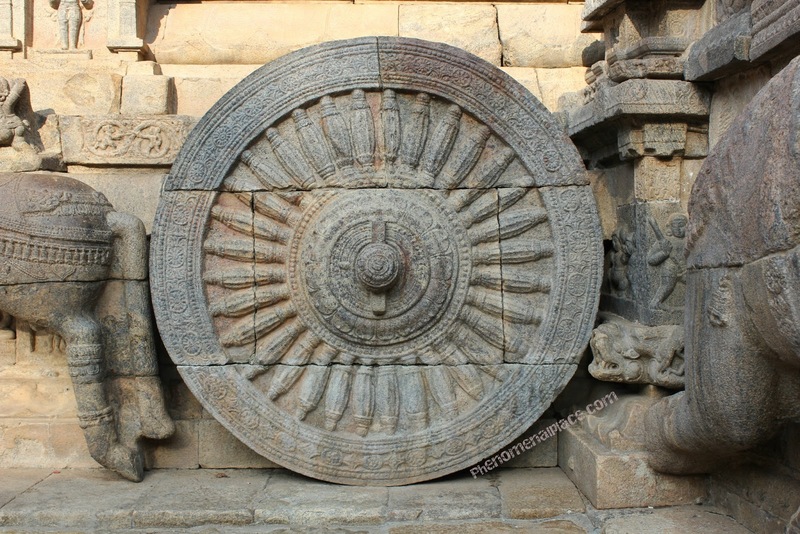 Why did the ancient builders take enormous pains to create this wheel? 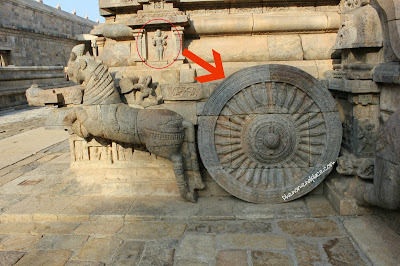 If you observe carefully, some spokes are actually carved on 3 different pieces of rock. This kind of precision is nearly impossible! But why did they go to great lengths to achieve this? Merely for decoration? Not a chance! Let’s count the number of spokes – each wheel has 32 spokes. Believe it or not, these 2 wheels make up an ancient clock, a sundial, which is lying around undiscovered for many centuries, until now. Nobody knows that this is a sundial, even though all these carvings – the timekeeper, the morning sun, and the evening sun, specifically indicate that this is a sundial. These 32 spokes divide 24 hours into 45 minute segments. One wheel can be used in the morning, and the other wheel in the afternoon. Now you know why the ancient builders carved the morning Sun above one wheel, and the evening sun above the other wheel. 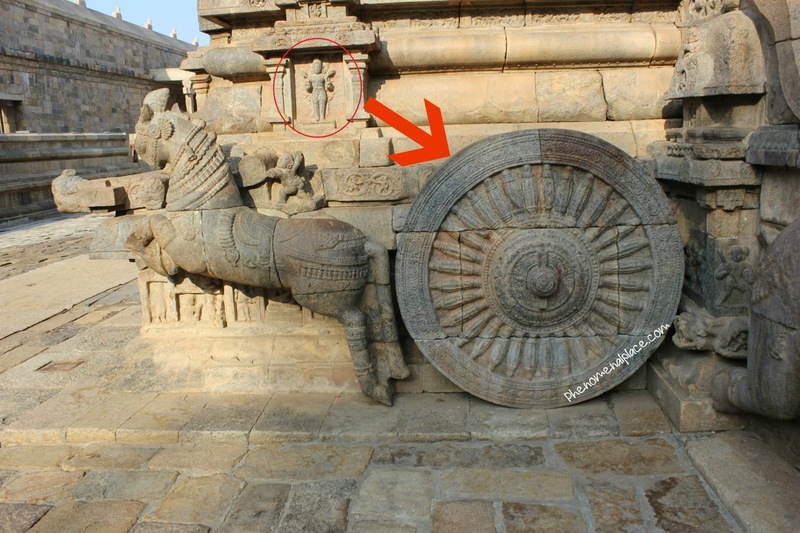 In another video, I have already shown you how the Sundial at Konark Sun Temple works in detailed fashion, so I am not gonna bore with the same information. But really quickly, the angle between each spoke represents 45 minutes, and 45 minutes are split into 10 beads, which can specifically show the current time up to the accuracy of four and a half minutes. I have asked the locals and the priests, but nobody knows that this is a sundial. Searching on the internet also gives us no results, which means I have just discovered this sundial. Historians tell us that the oldest sundial in India exists at Konark temple, which was built around 1250 A.D. However, this temple was built in 1150 A.D, 100 years before Konark temple. So, I think I just discovered the oldest sundial in India. This seems like a fairly intelligent discovery, but let us go back in time, about 800 years ago. This would have been common knowledge! A visitor would walk around the temple, look at the Sun God, and immediately recognize that these wheels tell time. Just like how we look at our watches today, he or she would calculate the time, and walk away. Yet historians are telling us that 800 years ago, most people in India were uneducated and living in mud huts. Archeologists who have documented all these carvings will tell us these Gods were carved out of blind faith, and have no scientific or practical meaning. 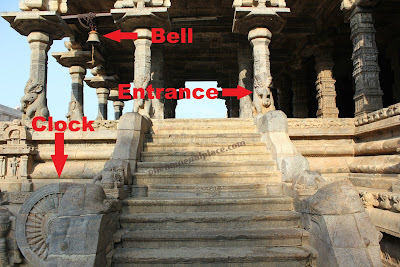 In another post, I have already shown you how the entrance and exit signs are carved at Darasuram temple. The entrance symbol is located near the morning Sundial and the exit sign, near the evening Sundial. If you have worked in an average store or a gas station, we use something called a "Time Clock System". Every day, employees get their cards punched with the current time before they start working, and just before leaving they get them punched again. It turns out that the ancient Indians did the same thing: An employee of the temple would look at the morning Sundial before entering the premises, and after his day is over, would look at the evening sundial while leaving. Even better, they might have had guards at the entrance and exit signs who noted down when the employee entered or left, using the Sundial. The truth is, every ancient Indian temple has loads of hidden secrets hiding in plain sight. If you start looking, you can understand why these brilliant carvings were created. For example, look at this little guy (below picture) who is driving the horse and the chariot. Under the morning sun, this guy has just started his day, his hair is well groomed, he is smiling and his one leg is in front of the other, he is looking forward and has just begun driving the chariot. Under the evening Sun, the same guy is carved frowning, because he is tired, his hair is all messed up, his legs are wide apart, one of his hands is on his hips, and he is looking away from the horse, because his day is over. If you visit this temple, look at the elephants as well, they give you enormous insight about what the ancient builders were really trying to tell us. Now, I want to point out that this sundial is just the tip of the iceberg. There are bigger secrets hiding in plain sight. For example, we found the eternal timekeeper carved below one of the horses. What lies below the other horse? A big surprise! Lord Buddha. Why is Buddha carved in a Hindu temple? Historians swear that Chola Kings who built the temple were strict Shaivaites (worshipers of Shiva) and were intolerant of other faiths. However, we not only see other gods such as sculptures of Vishnu in the temple, but also Buddha! This shows that the Chola Kings were not just tolerant, they were welcoming other religions into their temples. The Tamil kings had a brilliant way of embracing all cultures: they used both Tamil and Sanskrit names, and allowed all faiths to merge into Hinduism. Every carving has a meaning, so why is Buddha carved under this horse, hidden from the eyes of casual visitors? This hand signal of Buddha is also rare to find in ancient sculptures. This hand signal is called 'Jnana Mudra' which means “Symbol of Knowledge or Wisdom”. What knowledge is he pointing to? How is he connected to the eternal timekeeper on the other side? 1) The term Kaala not only means time as in Past, Present or Future, but has deeper scientific meanings as well. The ancient Sanskrit and Tamil texts show something quite interesting: A day, which is 24 hours, is divided into 60 units of Kala. Therefore 1 unit of Kala is equal to 24 minutes. 2) Buddhists use a complex and esoteric teaching called Kalachakra, which literally means “the wheel of time”. The ancient text by the name of “Kalachakra Tantra” describes 2 wheels, the outer wheel and the inner wheel. 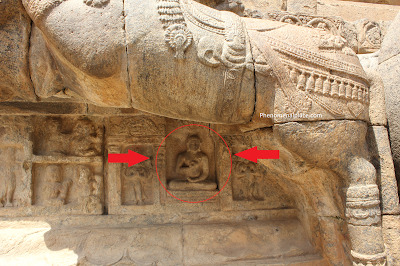 3) Below, you can see carvings of a few more deities carved nearby, which will help your further understanding. Who are these gods? And why are they carved nearby? 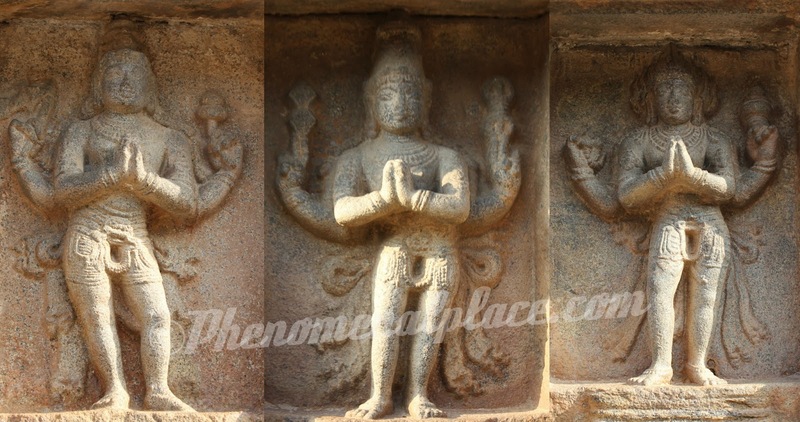 Identify these gods and find out the ancient builders were telling us! Decoding these points will lead you to bigger secrets. May be the secret is hiding in plain sight, try watching the video, examine the pictures posted here and comment on what you found. Don't forget to share this post with your friends because hey, India just got its New Oldest Sundial. I think this finding is very important from the historical point of view! thanks for sharing! Awesome work on your findings, I love the vids you put out, I only lived in India for 2 years at Woodstock boarding school and never saw any good places, now I am learning more about India back here in the States then when I lived there. May be I could be more helpful to you..
Because I may be the Kala bhairava amsha..
You've covered great details here. Great job! I wanted some help beyond this. I'm looking for medieval Indian Sun images. You know where I can get them? Any help will be appreciated. Your findings are awesome, I really appreciate them! Another doubt for me is that y the wheels are made of 6 pieces of stone, does the pieces denote 6 seasons? i will prove it is not a sundial. Hi ! Appreciate your effort. One observation. In the audio part you mentioned that both the wheels are having 24 spokes. Each spoke represents 1 hour. Which is not correct. The wheels are having 32 spokes. And each spoke represents 45 minutes. Later i found that it has been correctly written in the script. Please update the audio part. The two things which I noticed as I am a deep follower of Hindu mythology as well as science fiction. The morning time wheel which shows the time keeper, who can see both the past and the future which gets depected in the second time wheel, which shows Buddha as Buddha is of the era far ahead of the era when this temple was built. Really appreciate your work. Regards Sudeep. Beautiful research work. In the ancient times a day of India was divided into eight"prahar". So we can say that each spoke of the wheel is for quarter of one "prahar".